Our little metropolis of Pittsburgh has appeared in national headlines a lot recently. First, with the horrific events that occurred in Wilkinsburg at the beginning of March and second an incident, some might argue, just as horrific as the first. 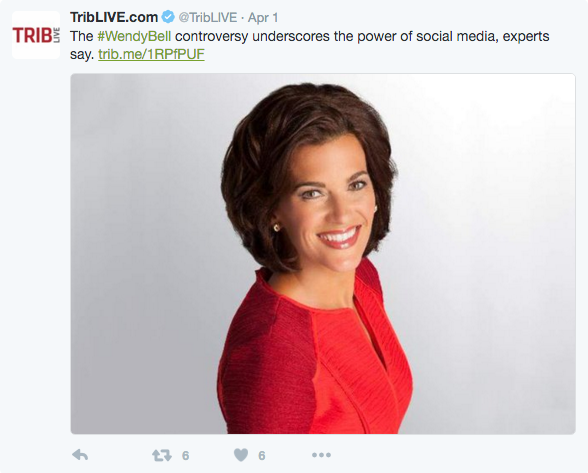 Local news anchor, Wendy Bell, from WTAE has been fired for comments made on her Facebook page in relation to the aforementioned incident. Now, we are not here to argue whether or not Bell’s comments were inappropriate or discuss whether her termination was just. The fundamental issue is WTAE did not have clear social media guidelines or policy in place to outline to their employees what is appropriate and inappropriate to post online. Currently WTAE is not sharing it’s social media policy, but it is obvious social media best practices for WTAE were not properly communicated to all of its staff. Pittsburgh residents know that Bell has a personal and a business Facebook page. Unfortunately, the page she decided to post her questionable commentary were riddled with the WTAE logo. Perhaps Bell would still be behind the news desk had she not blurred the lines between public and private social media accounts. Her comments might not have caused such an uproar had she posted them on her personal page and not on the page with her company’s logo conveying that these were not only her opinions but WTAE’s. For company’s and their employees, the take-away is this: social media policies and guidelines cannot be left out of any employee handbook because if they post anything using their company’s logo, trademark or any other affiliating collateral it is the same as posting on behalf of the company (unless they claim otherwise). If you are doing business online (and by 2016, you all should) then you have to assume your employees, clients, business partners and even competition are talking about you online. In order to properly manage your reputation and brand on the unpredictable digital landscape, concisely outlining how your employees communicate your message is crucial, but effectively disseminating the policy and any updates to it will help prevent online crisis. *Tips were paraphrased from an article written by Tiffany Black (Inc.). Read the full article here.